One of the greatest things about my job is meeting new friends. Some people take their friends to the green to go golf, or the bar to drink, I take my friends to the beach to go dive or surf. 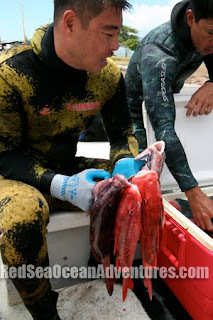 I had the pleasure to go for a dive with Dr. Michael Tripp. 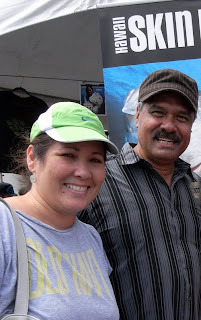 He's been traveling with us on a number of Red Sea dive trips and when he told me he was coming to Hawaii I had to show him around my neck of the woods. 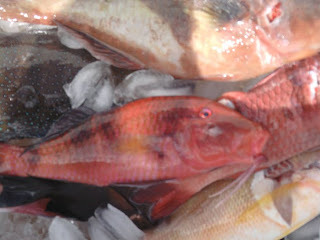 Mike recently went to Mexico and got a load of groupers. He is a great diver and if he's not working he is in the water. We got to see Ono, Rainbow runner, Dolphins, and huge Tiger Shark all in one dive. Thanks Mike for a great day! Next time stay longer! Another Doctor Michael Wall, went with us on a trip to Mentawais this year and he and I shared some of the best waves of the trip. He had his go pro camera rolling as we surfed on of the best rights in the world. He got caught inside while I took of in front of him. This spot is finicky and doesn't break often. In fact in all my 10 years of traveling here, this is my second time surfing it. 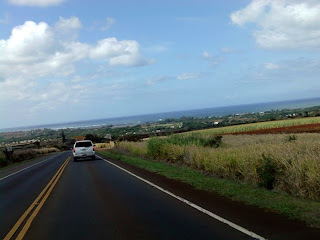 A 300 yard plus wave that barrels and is twice the length of Laniakea on a good day. Thanks Mike for sharing this pic with me. Can't wait to go back next year! We've been blessed to have such great support from all our community! From all our local divers who invite us on their exciting trips for us to get footage, talented musicians who contribute their latest songs, and sponsors who support the show. Lot of people don't realize the value of our sponsoring companies who advertise with us. Without them we wouldn't be here and because of them we have been on air for 8 seasons! So buy their products! Merlinda Garma has been with us from the beginning and she has continued to be the spokes model/host/hsdtv queen who everyone wants to meet. She is smart, talented, energetic, and very down to earth girl who can memorize anything. Here she is in the latest line of Jams World apparel shooting for the next episode of Hawaii Skin Diver Television. Tuesday November 1st, 8:30 pm. 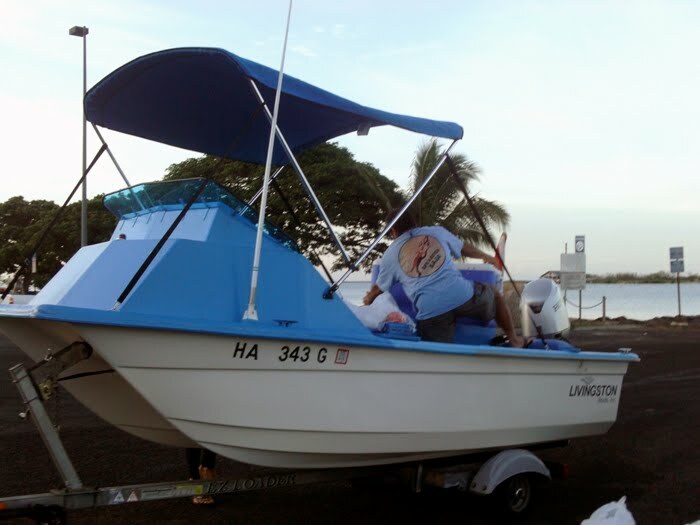 Channel 1016 or 16 premiers the new Hawaii Skin Diver Television episode featuring a Maui dive. Captain David Miyake, Lance and Raymond Otsubo take Wayde Hayashi, Kimi Apiki, Kimi Werner, and Lauren Bartlett on a fun weekend dive! It was a great day and good times we had filming with them all. 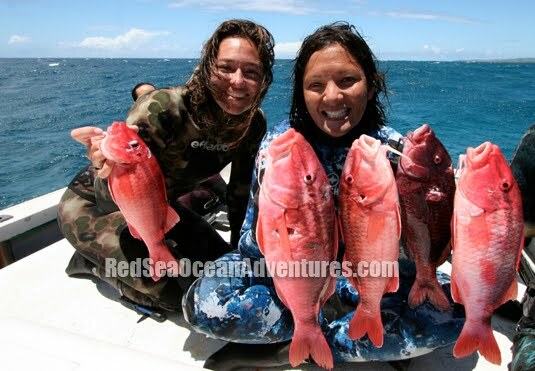 World Class paddler Lauren Bartlett (left) and National spearfishing champion Kimi Werner (right) were on the hunt for the prized Kumus. We tried to play around with the head camera so it gave a different angle to see from and test out Lance Ohara's new pole spear . You can also watch it online via www.oc16.tv. Just turn on your computer and watch it streaming live. We hope you enjoy the show! (from Greek: ἰχθύς, ikhthus, "fish"; and λόγος, logos, "study") is the branch of zoology devoted to the study of fish. Last year I was invited to go do some filming with one of Maui's finest divers, Lance Otsubo and his friends. We tested out some new equipment and was able to land a few nice kumus. These fish are one of the finest fish to steam "chinese style". Well if you wanna see Lance in action stay tuned for the next episode of Hawaii Skin Diver Television where we are featuring a Maui show. Small windy surf this weekend so plan was to work, edit, and plan more trips! Went over to the carnival at magic island and guess who I saw? Yes! Spiderman was there so had to get a picture with one of my cartoon heros! I wish I could leap over tall buildings and fly through the air too! I would save so much time avoiding traffic and not have to worry about tsa lines or excess baggage when I travel. When I was growing up, after school I always looked forward to watching spiderman, kikaida, flinstones, gilligan island, and brady bunch. Now days I wonder what the kids like to watch? I see some junk cartoons and heros now on tv. Off the soap box now...Winds should be lightening up in the next few days so gotta gear up to get barreled and eat more fish! Today the surf was small all over the island so plan was to go dive! Go-Naminori charter boat was gased up and gearing to go. Kirby has been working on his new toy for a while and wet paint and all we went out anyways. Our objective today was the 3-C's of diving. Water was a little dirty but we still managed to 1) CATCH a few fish for dinner. Kumus, Jo's, Uhus, and Koles was on the stringer and it was nice to get in some diving again. 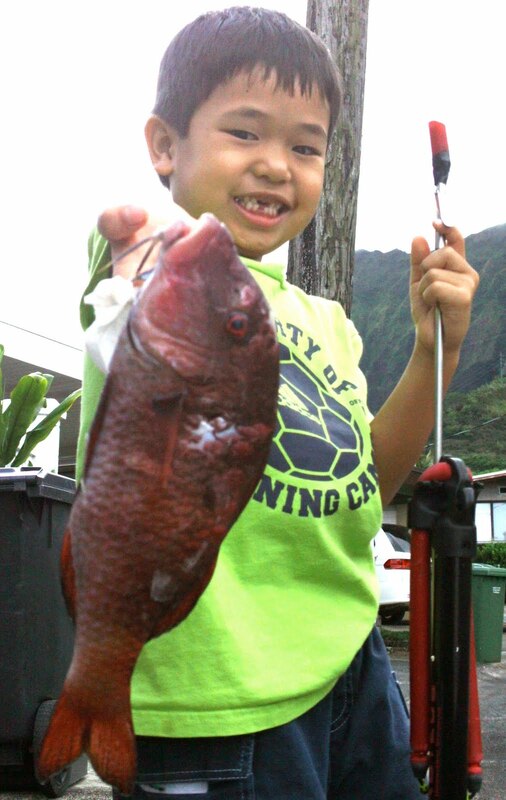 Check out this little diver guy, Maika with a nice catch! Strike da pose! I made him scale and gut the fish afterwards so he can learn how to 2) CLEAN fish. Next we got to work on how to 3) COOK his fish! 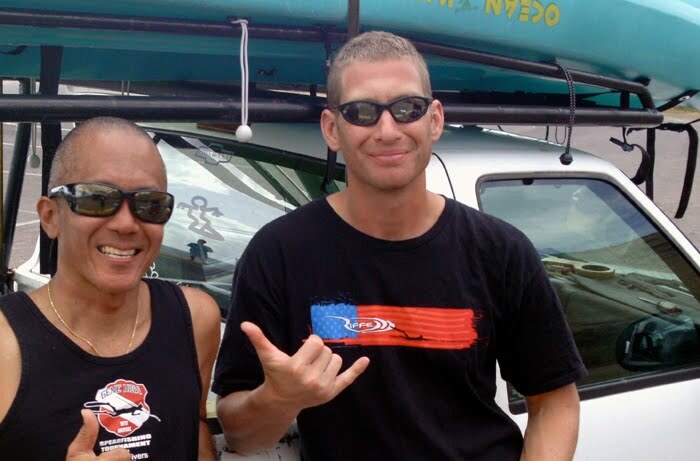 Thanks Kirby/James for a fun day on the water! 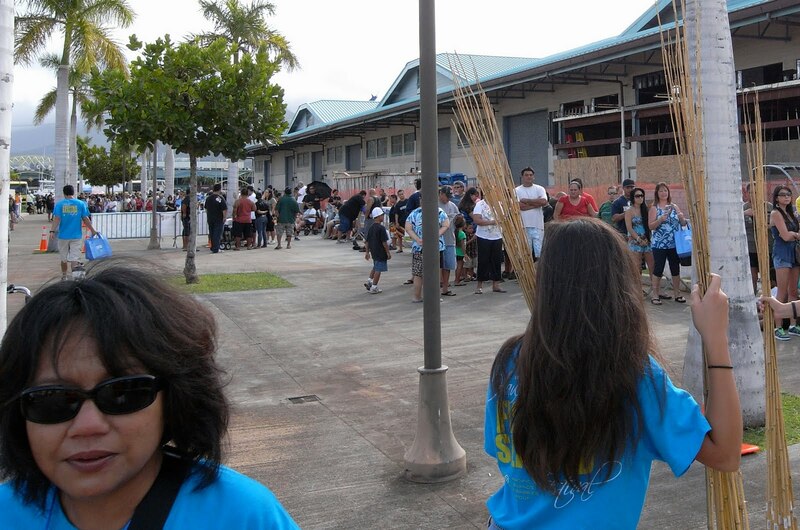 Lot of people lined up for this years Hawaii Fishing Seafood Festival even before the opening time. Some must have walked for a mile to just get in. Here Sundae Funai (bottom left) was helping at the front gate directing traffic. Thanks Sundae! Hungry shoppers were satisfied at a variety of food stations from fish, hawaiian food, waffle dogs and more. Thanks guys! 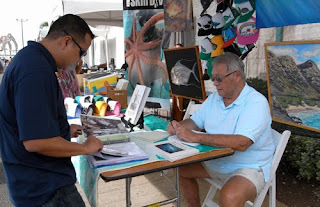 Lot of people tell me how much they love the music of Hawaii Skin Diver TV. Well we were fortunate to have Chucky Boy Chock and his wife Tammy drop by our booth. They have been so supportive and we are blessed to have such talented musicians willing to support us. They even came out with a CD for our viewers to purchase. Thanks Chucky/Tammy! Reid from Hanapa'a Hawaii was also in the house selling HSD shirts, magazines, and ice cream! Reid knows alot about fishing and I always find myself picking his brain. Thanks Reid! 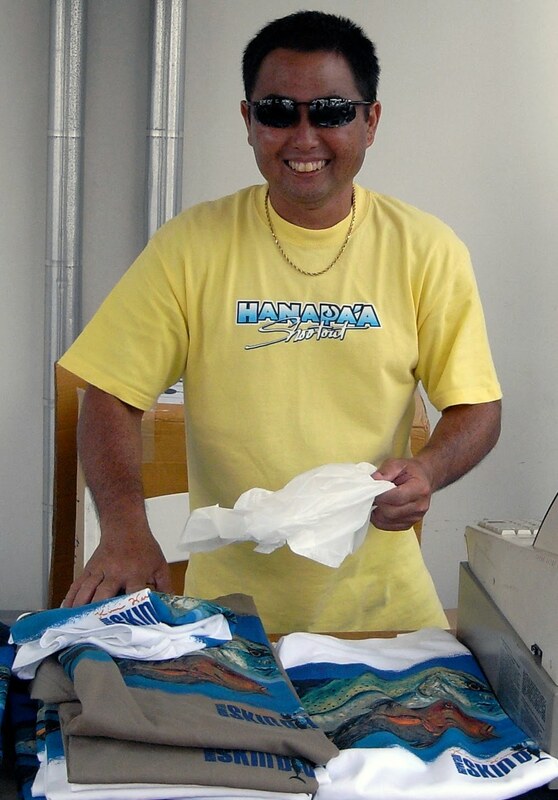 And of course legendary Richard "Sonny" Tanabe was promoting his new book coming out soon. Here the "Hij" was checking out the sample book to come. 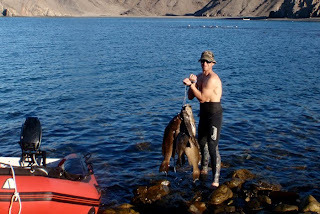 Sonny has also been an anchor in the freediving/spearfishing community despite how busy he is he always makes time for me. Thanks Sonny! What a long fun weekend! 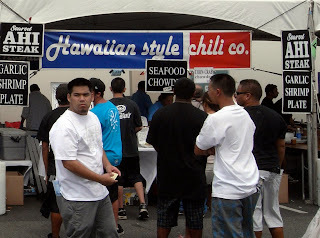 The 6th annual Hawaii Fishing Seafood Festival was the place to be! We set up by 8:00 am and waited for the huge crowd to come in at 9:00 am. This was our booth featuring trips, tv, gyotaku, and more...we were blessed with great weather, cool breeze, and no rain! 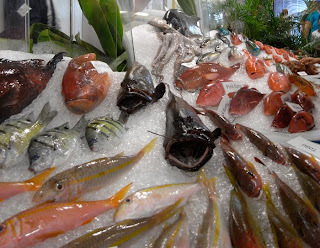 Inside the fish auction there were a display of types of fish from reef to blue water fish. 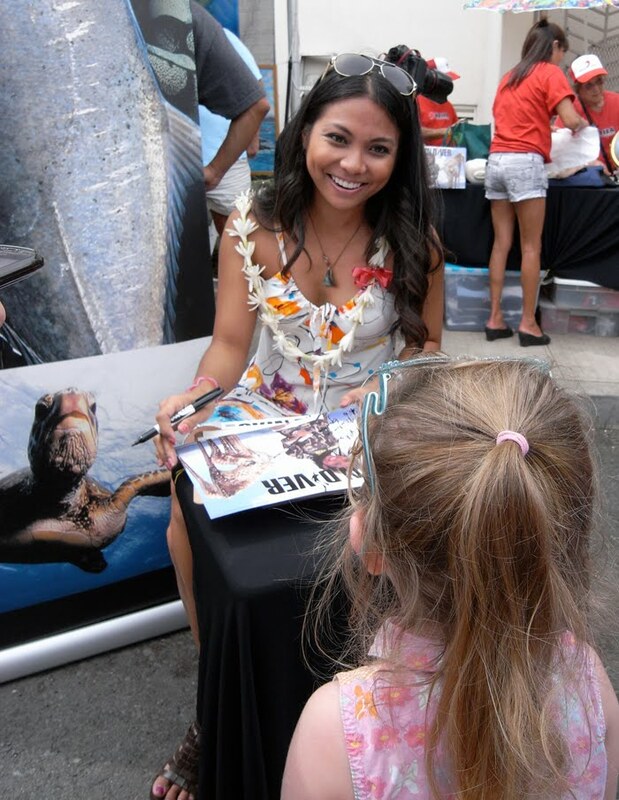 but the big draw as always was meeting "Merlinda Garma" from Hawaii Skin Diver Television. She drew a line of fans waiting for her autograph. Kids lined up waiting patiently to meet her and take pictures with her. 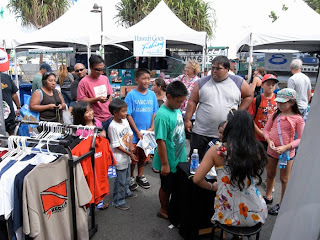 Even "Hawaii's Goes Fishing" host Cindy Paliracio was there to represent their show. It was such a awesome event and great way to bring the fishing community together. 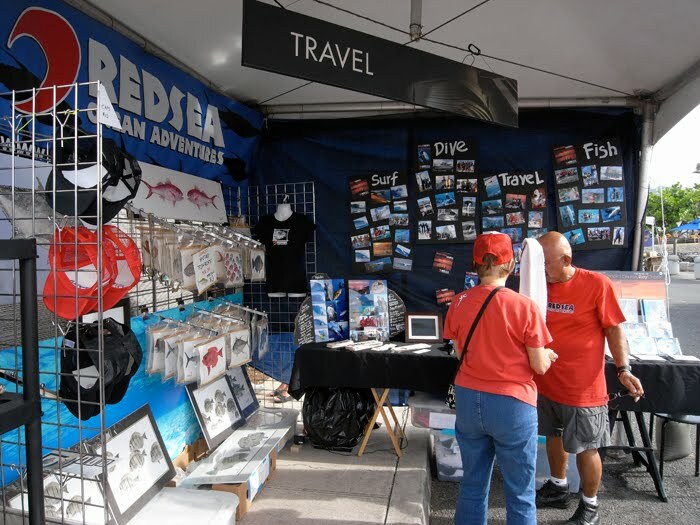 Great times, good food, entertainment, and things to buy. 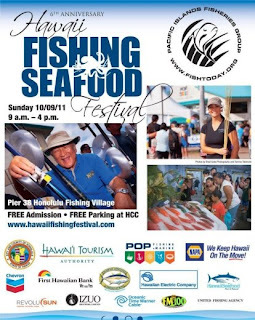 Mahalo to Pacific Island Fisheries Group, all our sponsors, helpers, clients, and fans for coming by. Until next year! Hanapa'a! After a fun week of south swells looks like the north will come alive next week, can't wait! Today we had an hour to spare so went to the pier with mamo on our mind and we got lucky! My nephew Maika casted his line and patiently waited for a bite. After 10 seconds he pulled the bait up, 5 seconds later he checked his bait, 5 seconds later got tangled on a rock, then after reseting his line, bam! Left corner went off, floater went down, and he was on! 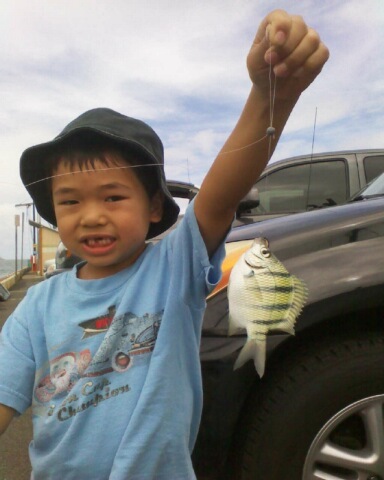 He was so stoked out of his mind and I think he is hooked:) He may be ready to dive soon. As the old chinese proverb goes.."Give a man a fish and feed him for a day, teach a man to fish and feed him for a lifetime". Aloha Tuesday all! Lots of fun summertime surf in the next few days so finish your work early and get out there! Been busy gearing up for the 2011 Hawaii Fishing Seafood Festival coming up this Sunday, Oct. 9, 2011 at Pier 38. We will be in booth #39, so come visit us if you can and get Merlinda's Autograph. There will be lots of cool stuff here for the family, great food, good times. Tonight premiers a new episode of Hawaii Skin Diver Television so tune in to OC16 or online at www.oc16.tv at 8:30 pm HST. Enjoy!